That’s right, it’s another installment of Stew’s Reviews, fanboys (and fangirls, of course, because I am an inclusive fellow). Here’s moving into the realm of Image Comics for this week with a review of the “Confessions” story arc from Astro City! Speaking of confessions, here’s mine right off the bat: I got into Astro City far, far too late because I am a terrible and lazy person. And by far too late, I mean I never got around to reading any Astro City until about, oh, 3 years ago. I was reading through every book on a list of best comic stories that I found, and two of the selections were from Astro City, and I was just enamored of each of them. Shortly after that, I got my hands on the first 25 issues or so of the series on the cheap at my comic store, and it just furthered how much I adored this series. It’s a huge regret of mine that I wasn’t reading this series when it first came out, but hey… let’s just call it “good things come to those who wait”. 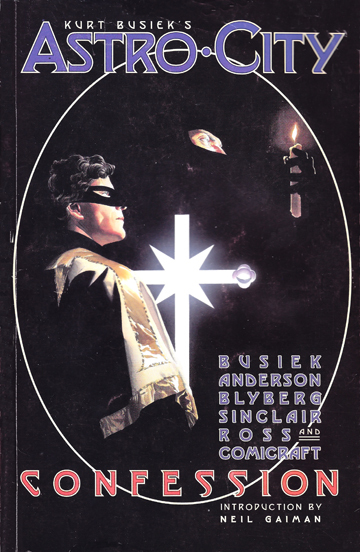 In Confession, a story that originally ran though from issue #4 to #9 of Astro City volume 2, Kurt Busiek, Brent E Anderson, and Will Blyberg craft the story of Brian Kinney, a boy of only fifteen years old, running away from the pain of his childhood in the rural town Buchanan Corners so that he could live in Astro City among the world’s greatest superheroes. We learn early on that Brian’s father, a doctor, had passed away somewhat recently, and that he was penniless when he died because he dedicated himself to pro bono care and treatment for neighbors who could not afford medical attention. It was ultimately a combination of cruel taunts from other children (which seems odd for kids to make fun of the orphaned child of the man who kept them healthy for free, but kids are jerks, you know?) and Brian’s desire to be more successful than his father that drive him to the city. Brian doesn’t seem to have endgame in mind when he arrives—he is fascinated by superheroes, but aside from being fit and having some passing martial arts training, he has no means to become one—but quickly finds himself a job at a prestigious, upper-crust club for heroes in their down time. An errant D-grade villain by the name of Glue Gun (an obvious tip of the hat to Marvel’s Trapster) tries to make a name for himself by getting the drop on the heroes at the club, but he is actually defeated by Brian when he tries to take our protagonist hostage, leading to Brian being tapped by the mysterious detective hero The Confessor to be his sidekick. And that’s what I love about Astro City; it tells great stories about characters who feel familiar. Brian Kinney, redubbed Altar Boy by The Confessor much to the former’s annoyance, is a proxy for Robin, just as The Samaritan, Winged Victory, and the First Family are analogs for Superman, Wonder Woman, and the Fantastic Four, respectively. In this way, Busiek is able to tell us not only a great original story, but also a story about a character we “know” that we’d otherwise not get to read (put more simply, I have referred to another Astro City tale called In Dreams as one of the best Superman stories I’ve ever read, and Supes obviously isn’t in it). It’s the chocolate-and-peanut-butter of the comic book world. As Altar Boy learns the hero craft under The Confessor (who keeps Brian at arm’s length and refuses to divulge his own secrets), the super hero community faces a crisis when not only is there a shape-shifting alien on the loose making the heroes look bad, but there is also a ritualistic killer roaming Shadow Hill. As the Shadow Hill killer racks up a body count, the residents of Astro City grow to distrust their protectors for the first time in decades. Just in time to become one of the heroes he always idolized, Brian is having garbage thrown at him by citizens and feeling the heat from a mayor’s office who wants heroes to be held publicly responsible for their actions… by force, if necessary. Suddenly he finds himself torn between giving up and moving on with his life or continuing to do the right thing while not feeling appreciated for it—exactly the kind of attitude he resented his father for having, because symmetry is fun in fiction! Things get even more tumultuous for Brian when he puts together all of the pieces and puzzles out that The Confessor is actually a vampire. Frankly, it’s ludicrous how many details Busiek is able to fit into this story without it feeling at any point to be bloated or rushed. The mayor tries to install a registration program for Astro City’s heroes. There is a massive alien invasion scheme forming. The city calls in an occult specialist to investigate the murders on Shadow Hill. Brian deals with the relationship between himself and his mentor, the religious vampire. And this all happens in the span of the last four issues of the arc! Kurt Busiek could teach a master class on pacing and detail. Now, granted, the Shadow Hill killer is something of a red herring to the rest this story (it doesn’t factor in much, and is solved, more-or-less, off-panel), but it still contributes to the mood and flow of the arc and serves as a vehicle to steer the mood of the rabble. What really floats this story, though, is Brian. He is the narrator and the focus, and if he were uninteresting, the whole tale would flop, regardless of everything going on around him. But he comes across as a genuine teenager: he’s moody, he’s mad at his parents, he wants to rebel against authority, but he’s ultimately a good kid trying to figure out his future. For all the complaining about his father that Brian does, he’s clearly (if unconsciously) adopted his father’s lessons in his own life, since he wants to be a hero even when the glamor of being one has faded. Personally, I love that this kid wants to quit being a hero, but won’t because he’d rather stick it to the mayor; that’s such a fifteen-year-old kid way of thinking. +The worldbuilding in Astro City is great. The juxtaposition of all these different heroes and villains all occupying the same space while being so distinct is well done. You’ve got global heroes fighting massive crises. You’ve got religious fanatics that have bonded together to use their powers to spread the word of God. And you’ve got the whole supernatural area of town that everyone is a little scared of because they don’t understand it. There are low-rent bars where some of the more surly heroes hang, and then there is a fancy prestigious club for the more sophisticated ones. Busiek really put some time into developing Astro City, and I kind of hate the fact that I don’t know that I could ever do as well in my own writing. Heh. +Brian, as I mentioned, feels flesh-and-blood real. I mean, there are aspects that are comic book-y (this 15 year old kid is beating the snot out of adults because he trained in a dojo before he left his podunk town? ), but by-and-large he absolutely carries the book and keeps you hooked. +There are a lot of details to throw you off the trail of where the story might go. I thought for sure that it would eventually be about The Confessor and Altar Boy going into Shadow Hill and working on that case, but nope! Alien invasion storyline time instead! That was a swerve (the story does set it up in the second chapter, don’t get me wrong) that really took me off guard, but in that “Whoa, this is a great twist!” kind of way. -Oh my god, if I had to read one more time about how hot it was or how hot it was getting, I might have slit my own wrists. For as thoughtful of a writer as Busiek is, he really just keeps hammering away at the analogy of the physical weather mirroring the social temperature of Astro City’s mood towards its heroes. It’s extremely heavy-handed.I got it, Kurt, move on. -This is minor, and I did say above that it was a neat aspect of the story, but it’s disappointing that the solution to the Shadow Hill murders–which are so important to the story–is just handed to the reader in some end-of-story narration. Woulda been nice to actually see the resolution to that. Oh, I love me some Astro City, and out of all of the multi-issue storylines I have read from the series, this is one of my two favorites. Everything really works here, from Brian’s growth, to the Confessor’s conflicting personality, to the registration storyline. It also takes two comic book stories that don’t feel like they should belong together (the street level crime solving and the worldwide alien invasion thread), and just blends them into a cohesive, fluid story. I’ll always feel like a schmuck for not getting into AC sooner than I did, but when it comes to stories like Confession, late is absolutely better than never. Absolutely check this out if you get the chance.